The Sent Items folder isn't always visible in Outlook Express. We'll look at the options to make the Sent Items folder visible, and make sure that Sent Items are getting placed there. The "trick", so to speak, is to make sure that the folder list pane is visible. The item to pay attention to is the one called Folder List. Make sure that is checked and press OK. There's one more important setting that's also easily overlooked. Outlook Express only actually puts things into your Sent Items folder if you tell it to. The arrow points to the setting we care about: make sure that "Save copy of sent messages in the 'Sent Items' folder" is checked. this my hotmail id when i configure outlook giving this error,pls help me. That error seems pretty clear to me - you can't use Outlook Express for free Hotmail accounts. i can't use my email in outlook? I have the sent items folder and know where to find it. My problem is that when I press delete to remove certain message from this folder, they don't go anywhere. They stay right there and the delete does not seem to work for this purpose. Please help. Our sent mail does not always end up in the sent mail folder. I would say one time out of every 7 or 8 e-mails does not show up in sent mail? Why can't I send messages, I didn't have to pay a separate fee before, it was included in my free subscription, I don't think it is fair. Emails in my send items forled is being deleded autometically after few months. This time all my mails in send item box (from 1/06/2007 to 12/26/2007 and as well as all mails from 9/27/2007 to 11/5/2007) of out look express were deleted . Are there any way that IO receover this deleted mails of send item box. 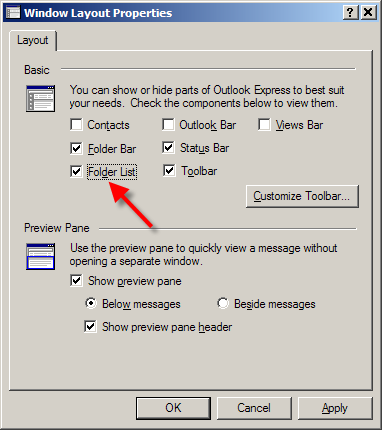 I also am unable to find the "sent" items in Outlook Express - I read your instructions but right off the bat - how do I get into the "Window Layout Properties" window? It doesn't show up under "View" from the IE toolbar - how do I get into outlook express to get into that window? Actually, my problem is slightly different. I can see the sent folder, and I can send email but outlook express does not save one copy of the sent email to the sent folder. It just stopped 3 weeks ago. The "save a copy of the sent messages is checked in the tools-options-send but still nothing . I cannot prove that I sent any email. Can you please help me with that?? Sellin, I had the same problem you mention above. A few weeks ago, it appeared that my sent messages just stopped being saved even though the appropriate box under options was checked. Upon closer inspection, I found that something screwy happened with the dates on the most recent messages that did appear in the sent folder, and the date sent reflected dates in the future. In my case, the messages at the top appeared to be dated as sent in June 2008!!! I scrolled down to the actual date and found all of the messages that I sent where they should be by date, but with a gap in the chronology of a couple of weeks. Some kind of time warp???? Or a faulty auto update download most likely. No they are out of order, but at least they are there. Can you please help me with that?? Today all my sent messages are deleted automatically?> What should I do? Hotmail saves sent messages and I can access them thry MSN but OE says that it cannot open the folder. This is a new problem as I have not had any problem in the past. Ideas????? This was great! I work for an internet service provider, doing troubleshooting. This has really helped.We dont support this product, however because of your help,I was able to assist my customer. and have experienced no problems. but when I compose and send the message is sent but there is no record of it having been sent in the Sent folder. I have checked the Tools -- Options ---Send tab and it still has "save copy of sent messages ......" ticked, but it does NOT. Hi, I too, like several others that have emailed previously, am having problems with my Sent Items in outlook express. The box is checked to save a copy of the emails I send... it does put them in the Sent Items folders but after a period of around 24 hours... the sent items are automatically deleted!!! I do have McAfee. Please help! I can see the sent folder, and I can send email but outlook express does not save a copy of the sent email to the sent folder. It just stopped 3 weeks ago. The "save a copy of the sent messages is checked in the tools-options-send but still nothing . I cannot prove that I sent any email. I have had a similar problem with Outlook 2007. Suddenly all my sent messages disappeared and they only seem to be saved for a max of a month. I have also checked the 'save sent messages' box in options. Please can anyone help?? Same problem. 2 Outlook email accounts. One stopped saving sent mail on 9/8/08 the other on 9/5/08. In tools, the save mail in sent folder is checked. Please help. Two days ago my Sent Folder stopped collecting notice of my sent emails. This has happened in the past, but only sporadically. I have cc�d myself in on emails and they are actually being sent, but I have no record. Please help. I solved my missing sent mail by deleting all the items in the sent folders. Think they were too full. looks this sent email not appearing in the sent item folder is not just happening to me. Recently I have NOD32 installed and started on that day, my sent items folder emails were missing and now only have record up to Aug 2008 and all current sent emails are not saved. Please assist, having no proof of past email isn't doing too good for me. Thank you. I cannot view my folders I only get 2 panes, and I cannot see my folder list. What may be the problem. I was used to seeing 3 panes. Folder List > e-mail info. > email detail info. Where did my folder list pane go??? You say from View go to Layout. Where is this? Under View I have Toolbar, Status bar, Explorer bar (set to folders), Go to, Stop, Refresh, Txt Size, Encoding, Source, Privacy report, Full screen. 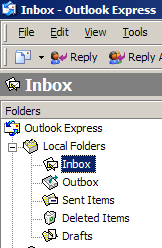 You're looking at the Internet Explorer View menu, this article is about Outlook Express. Sporadically, Outlook Express has stopped listing my sent messages. If I use the search function, some of the sent messages seem to be in a sub folder. How can I find them? My co-worker had the problem of a copy not being stored in his sent items folder and he asked me to "fix it". I finally sent myself and email and did a search of that email. It said it was in the Sent folder but the date was wrong. He had unknowingly changed his computer's date. Once changed all was well. I know this seems like a simple answer, but it is worth just checking first. Hello Leo I have outlook express in the office and i just set it up on the home computer and i the sent files did not load on the home computer is this normal and how can i get them on the home computer. After Outlook Express Compacted I lost all my sent items and they are not in the recycle bin. Also I am unable to send messages they stay in the outbox? Like Richie I to lost my "sent items". Everything after March11/09' is GONE! Yet all my "inbox" items, drafts etc are all there. i use "Outlook Express" can anyone help? I've tried "retore" to no avail. Got a hold of my internet provider and he had never run across this problem. Greg. I can see the sent folder, and I can send email but outlook express does not save a copy of the sent email to the sent folder. It just stopped 3 days ago. The "save a copy of the sent messages is checked in the tools-options-send but still nothing.I cannot prove that I sent any email. Its an "Outlook problem" guys! My sent messages stopped saving on Friday april 16th as well. Im not sure why but believe me, all these fix suggestions are NOT going to work. I am using microsoft outlook 2003 & these steps are for a later version. I also dont have a copy of my mail since April 22, 09 in the out look already set up like above. I have had the same exact problem it happened to my work computer and after failed attempts to get the i.t guy to call me back i decided to fix it myself. the solution is to clear your filter thats what i did go to the view tab then go down and hit toolbar a list will pop out and press customise and then clear all on your filter. obviously after this over 100 other emails popped out but i just deleted them all but it helped solve the problem. After a frustrating search on the internet about how my emailbox including sent items could suddenly disappear your answer was a revelation. Well done, and explained so well to those of us who are not computer nerds. 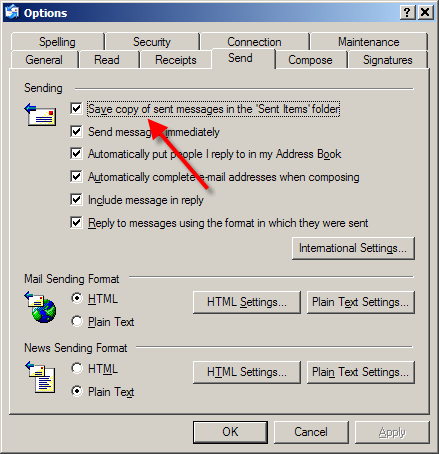 How can I find the sent Items in Outlook Express? I am using Windows XP home. There is a good emails earch script posted at http://www.biterscripting.com/SS_FindEmailStrs.html . Here is the command line to use it (per them - I am copying part of that web page). I use it to find lost email addresses, list emails from a friend, etc. Download the tool from http://www.biterscripting.com/install.html . THANK YOU!!!!!!!!!!!!!!!!!!!!! A BIG HELP!! This was driving me insane. I had the same problem. in my case the view menu showed grouping by conversation was on. Switching it off made my messages appear. I use a lot of messages with the same subject so grouping makes no sense. After I go to Vew Tab, Hit tool bar; NO customize comes up??? I followed all of the info on locating sent items (in OE 6) but lost ones didn't show up. Mine are disappearing every few days and I can't find them except in a BAK file which won't open. How can I turn OFF this disappearing/archive process? My Sent Items list suddenly stops at March 10- even though the Box save sent items is checked. Any light you can shed on this would be very appreciated. It is now March 23. I just had this problem and discovered that my computer's calendar had been inadvertently set back two weeks, so all the sent items were going into the sent box OK, but I wasn't seeing them because they were being listed way down the list. So, check you calendar. Also, send a message with a strange subject line and then search for it -- that's how I discovered the problem. My sent items is there but allthe items have disappeared and when I send e mail now nothing goes in there? i send a file too big with outlook express and i can't send anything esle , how can i stop(erase) the sending item? Here's an article written for Outlook, but should also work with Outlook Express or other email programs. After you see the Sent Items folder, in Outlook Express, how do you find a particular email that I sent on October 10, 2003, for example. I know I sent it--I want to see it again. Thank you. J.
I view the folder, sort it by date, and then scroll down to the date in question. You could search for it. Or sort the items by date to find it. However 2003 is a long time ago. Very likely Outlook Express archived those long ago to save you on space.